Continuing on our saga to hire good candidates – here is what we are looking for. I believe this applies both for our internal hiring at both Pragna and SmartCloud companies as well as the hiring projects we undertake for our clients. Essentially there is a lot of difference between high potential hires/candidates and just another hire/candidate. Though its not always possible to hire the “high potential” ones, one can atleast try to evaluate if we have found one! There sure is a very short supply of the high potential hires which is probably the only reason why Pragna even exists. 1. Ambition – I would rate this higher than the others just from the fact that we are talking about a “high potential” hire and not just another hire. Ambition drives people to scale heights beyond their means and wild dreams. Makes the impossible possible. This is #1 for high potential hires. So, sometimes I get excited when I meet people with ambitions and sometimes have been guilty of overlooking other things :-(. 2. Ability – One could argue this should be #1 (maybe true for regular hires). This is to validate some of the qualities/capabilities that one needs in oneself to achieve the ambitions. Some of these can be tested easily in the interview process and some probably is a gut call or a marginal call based on prior work history. 3. Agility – This is extremely important for high potential hires, that one demonstrates flexibility (especially in startup environments) and also tendency to take a step back to review/analyze, identify root causes and always to keep an open mind to change, feedback, business strategy, criticism etc. and should have openness to share thoughts and learn. 4. Achievement – If the hires/candidates have certain amount of experience, then the above must have resulted in some achievements in their careers. I would think identifying their achievements with special emphasis on the above areas would give proof points about their potential. I don’t think its right to measure this in terms of $ revenue achieved or the valuation of the company (which I have myself been guilty of in the past), but more in terms of overcoming the adversities and challenges to achieve meaningful outcomes. Well that’s it, The four A’s to find the high potential candidates; gives me little bit more structure to the interviews I need to do at Pragna and SmartCloud. What’s the worth of a resume anyway? The answer depends on whether its “A” resume or “The” resume. Let me explain – Majority of recruiters tend to send back as many resumes as they can find which kind of matches the text of the job description. Well – that’s what is called “A” resume. And I think it would be worth about $1. Adding up all the cost of access to job boards (probably 30 cents per resume) and labor costs of sending it along, it won’t be more than $1 especially with many shops worldwide competing to find and dump these. “The” Resume on the other hand is easily worth $10,000. Taking an average of recruiter fees (if any) or internal recruiting costs, it worth that much if not more. Big difference ha? Now the art of finding “The” resume is what makes the recruiters and recruiting projects succeed. The true skill and value of a recruiter is to increase the value from $1 to $10,000 or more through careful understanding of job, domain, candidate skills, motivation and interest, presenting the candidate profile and managing the selection process. Its time to ask the question when you engage a company whether they are in the business of finding “A” resume or “The” resume. Well just 3 months ago, I had not heard of NPA. But the concept itself wasn’t new to us. We at Pragna were looking at ways to grow our business and we stumbled upon the idea of partnering with other staffing/recruiting firms to share requirements and leverage our trained team to help make placements. I found good level of interest among the folks I talked to and within weeks we were working with 3 firms on a split fee basis. Then one fine day in Oct 2010, I bumped into a fellow owner of a recruiting startup. He said to me – what you are suggesting makes sense, but why not join NPA? You can reach out and partner with 100’s of firms instantly instead of one-by-one. Voila! this is no-brainer idea! Here we are 3 months later. We are member of the network and very excited about the immense potential of this network. We are thrilled with the professionalism, attitude and responsiveness we have seen throughout the application process and interacting with member companies. This is just a great way to increase the overall reach for our FTE positions and work with opportunities worldwide! I feel confident that we can provide better support to our customers using NPA network. In a short time, NPA has become one of the key focus areas for the company! Working in a Start-up is always exciting, challenging and at times can be frustrating as well. People who have come from a corporate world can see huge difference if they enter into a start-up. Well both have its pros and cons. Having been in Start-ups most of the time the main challenge I see is to motivate and retain employees. Employees need to be happy and satisfied more than any monetary compensation. The employees who always feel fulfilled are more productive in their work and can be an asset to the organization, and definitely stay longer with the organization. By implementing simple tips for retaining employees, you can keep your employees satisfied and can also be able to build lasting loyalty. 1. Share and Set Expectations- By sharing your expectations with the employees, they feel comfortable and stress free. You as an employer need to make them clear about the goals and objectives of the organization. You need to delegate authorities to them and assign responsibilities. Employees who really understand the importance of work can produce better results and really they enjoy being a part of a growing organization. Setting the right expectations will reduce misunderstandings and helps both employers an employee to achieve their goals. 2. Growth Opportunities- Employees join start-ups mainly to have good recognition and faster growth by taking risks. You can offer your employees different ways to grow ahead their current position. It is very important to tap their skills and assign right task and opportunities that yield recognition and promotion. The other way also can be by providing them ongoing education and training and also an option to learn while they are earning by providing extra and advance courses in your organization itself. 3. Feedback ( 360 degree): It is important to share feedback with employees. If your employees are doing good work then reward them by good words and extra perks. Incentives could be monetary also. Another important thing is also to listen to their feedback, which always helps a growing company in implementing new policies or procedures and for effective functioning. 4. Give Ownership: Ownership leads to responsibility and accountability. Motivate your employees to make good and better decisions that concern their job in the organization. If you throw your decisions on them they may react negatively to it. You should consider their ability to make decision and this will send the sense of responsibility among them and they can even perform better. 5. Work Culture: Employees spend good amount of their time at their work. The work culture and atmosphere matters the most. Treat them as your extended family and be sensitive to their needs. Create a fun filled atmosphere and have a weekly gathering and a monthly outing. These things are morale boosters and it helps them to get to know their colleagues have a healthy working environment. Always “We” culture works than “I”. Set a reminder for employee birthdays and have a small celebration, it makes them feel special. At the end of the day Employees are our invaluable assets and retaining good ones helps an organization to grow into new heights. Follow these simple tips and techniques make your organization a good place to work where everyone is supportive and full of energy. It’s been sometime since I wrote Pragna blogs. I got little busy working on some new product ideas. However its been an exciting time here at Pragna where we have just launched new products. The economy has improved and new jobs are trickling in… But finding the “best” candidates for your job is still quite hard. Though there are new social technologies to assist hiring in the past few years; the hiring consultancies and commissions have not quite changed. Tired of high recruiting fees and commissions? The average commission rates in the recruiting industry are 20% of the salary and that adds up to quite a large amount for a handful of hires. In my view such high placement fees and difficulty in hiring right candidates is resulting lost opportunities in putting more people to work. So we thought let’s challenge this practice of commission rates and come up with new products that helps our clients to hire faster and cheaper. How does it work? We assign a dedicated recruiter to work alongside your internal staff with specific weekly milestones for screening and sourcing. Typically they would source a minimum of 30-50 fully qualified candidates that meet all your criteria using job boards, social networking sites such as linkedin and zoominfo and direct head hunting. Our Commitment: We assign trained and highly qualified people who source candidates. They are typically engineers, graduates in your area who can understand your domain quickly to source high quality candidates. If you are not satisfied with quality of our work and sourcing, we offer no obligation warranty. We look forward to save a bundle of money for our clients and lower the unemployment rate! 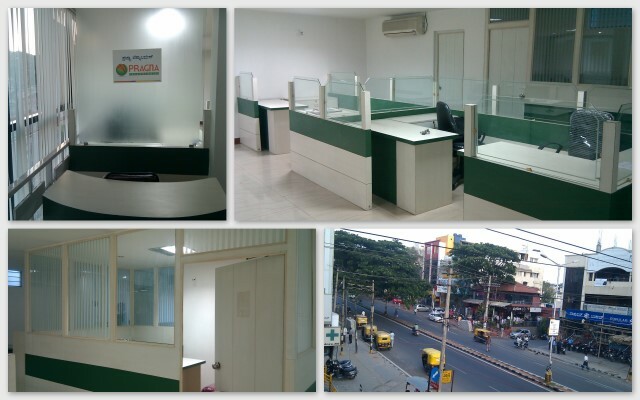 We started up our new office in Bangalore (Bengaluru) last week. The plan is to expand the operations here as we are getting good traction for our RPO and staffing business. We are actively recruiting for IT Recruiters / Senior Recruiters / Recruiting Managers for the new office. Pictures L to R – Lobby area, Cubicles, Conf Room, Buzz outside the window. We have fun evenings on Fridays; if you are looking for new career oppties, pls do drop-in.